President Recep Tayyip Erdogan of Turkey addresses the General Assembly’s annual general debate. Stressing that his country has spent over $30 billion to care for more than three million Syrians and 200,000 Iraqis fleeing war in their own homelands, Turkish President Recep Tayyip Erdogan took to the podium of the United Nations General Assembly today to call on the world to fulfil its pledges of aid. international community, especially the European Union (EU), for the efforts we have been carrying out,” he told the Assembly on the opening day of its 72nd annual general debate, noting that the EU has sent only 820 million euros out of the 3 billion euros, plus an additional three billion it promised. Mr. Erdogan said Turkey is waging “an intensive fight against the bloody terrorist organizations in the region such as the Islamic State of Iraq and the Levant (ISIL or Da’esh) and the Kurdistan Workers Party (PKK), and denounced efforts to change the demographic structure, such as Iraqi Kurdistan’s drive for independence. On the Middle East conflict, he stressed that the internationally endorsed two-state solution can only be possible if Israel immediately stops illegal settlements on Occupied Palestinian Territory, calling on the international community to support the Palestinian struggle for an independent and geographically unified Palestinian state in East Jerusalem, the West Bank and Gaza. 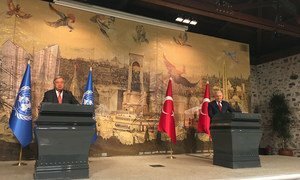 Underscoring the enormity of the plight of refugees, United Nations Secretary-General António Guterres today appealed for effective burden-sharing in supporting those who have been forced to flee their homes, as well as to those providing them refuge.